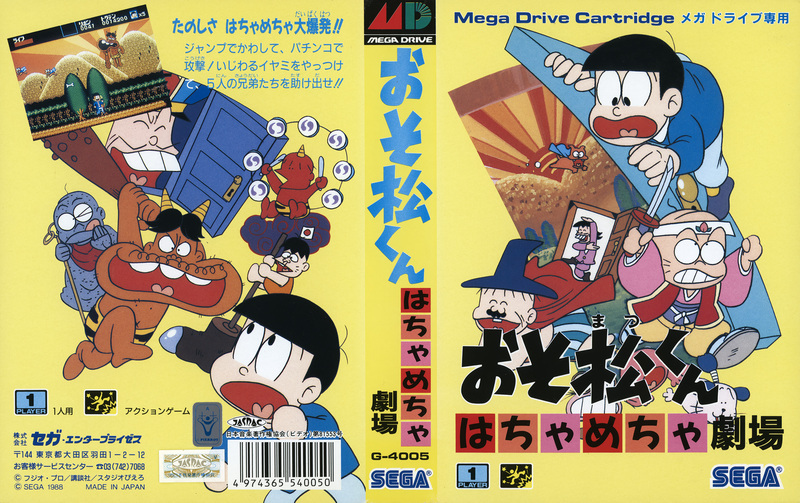 Osomatsu-kun: Hachamecha Gekijou is the first Mega Drive game that never found its way over to European or American shores. 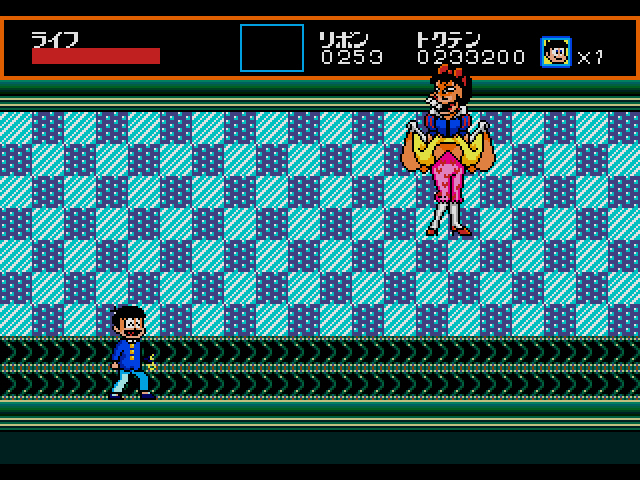 The game is based on an anime/manga of the same name, which ran throughout the majority of the 1960s before being revitalized in 1988. Hachamecha Gekijou (which translates to “Nonsense Theater”) was released solely to capitalize on “Osomatsu-kun”‘s rebirth and it shows. While the presentation is gorgeous and takes full advantage of the Mega Drive’s power, the game is short, shallow, and feels like it was made by a couple bored Sega programmers over a quiet weekend. Don’t let those homely green drapes fool you: the hut is actually a teleporter. “Osomatsu-kun” is a comedy based predominantly around the exploits of the Matsuno sextuplets. Each of the six boys have distinct personality traits, which usually leads them to clash with each other and those around them, including their parents, their rival, Chibita, and even their love interest, Totoko. Outside of brief character summaries on Wikipedia, there’s little information about the series, as it was never translated into English – though there are a couple episodes translated in Hindi on Youtube if you want to give those a go. Only the bamboo can save you now, Osomatsu-kun! 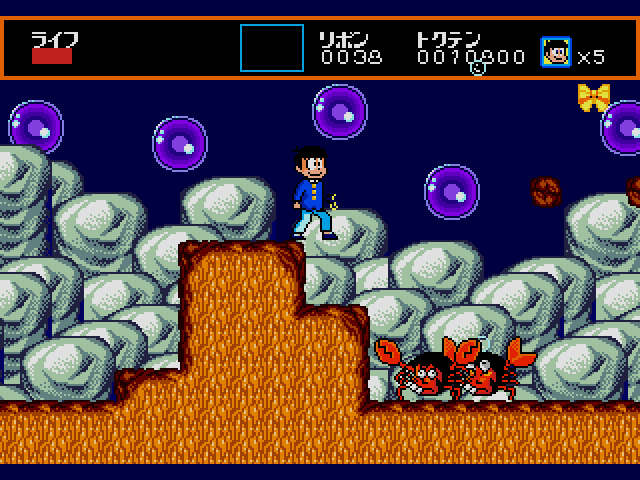 In Hachamecha Gekijou, you control Osomatsu, the eldest of the sextuplets around a surrealistic world. Armed only with a slingshot and what appears to be a limitless supply of sticky buns, you traverse across the landscape, laying to waste any and all insane cats, arrow-slinging Cupids, ostrich bodies with a man’s head and a woman’s shapely legs, etc. The enemy designs are mostly inspired (though some are uncomfortably racist). Think of a ludicrous design, the crazier the better, and Hachamecha Gekijou has one-upped your attempt at madness. For example, the second main boss is a man in drag, dressed as Snow White. He hops around, lifts up his skirt to reveal pink bloomers, then spews poison apples at you from said bloomers. The crazy is strong with this one. If only the rest of Hachamecha Gekijou was as ambitious as the enemy designs. 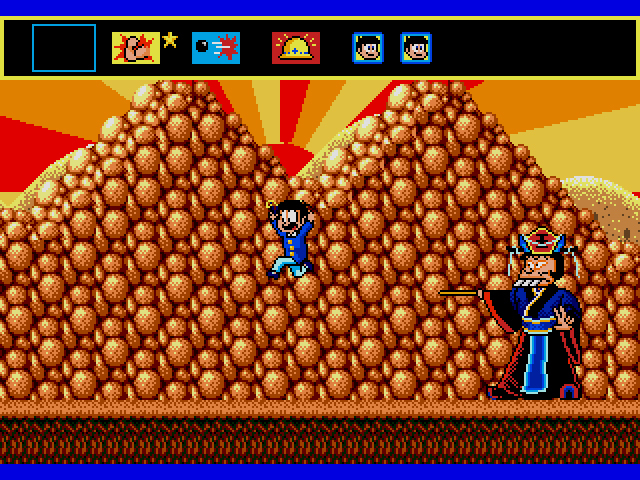 The gameplay is light platforming, with the goal of each stage to find the boss and defeat him. Each stage is short, but there are numerous paths to choose from, with only one path leading to the boss; this non-linearity makes the stages feel longer than they actually are. Paths include: doors that transport you to a different part of the stage, chasms that plummet you underground, and flying turtles that whisk you up to the clouds. The enemies drop ribbons and other health-replenishing items when you kill them. Ribbons are used as currency for the occasional shop. There, you can buy items, like a monk invincibility cloak, fireworks that damage enemies, and fish bones that call cats over to kill enemies, or you can play a slot machine to try and win extra lives or ribbons. Osomatsu-kun knew it would come to this. The shop and the slot machine are padding to make Hachamecha Gekijou feel deeper than it really is. As long as you kill enemies and collect the ribbons, you never have to worry about currency. Lives are also plentiful: you start off with five, and unless you run Osomatsu-kun into every projectile, those lives should last through the entire game. The items in the shop would be helpful if Hachamecha Gekijou featured more intense scenarios. Perhaps a colony of bumblebees launching their stingers at Osomatsu-kun would necessitate a blast of fireworks, but more often than not, his standard sticky buns work just fine. The graphics are sharp and mesmerizing at times. 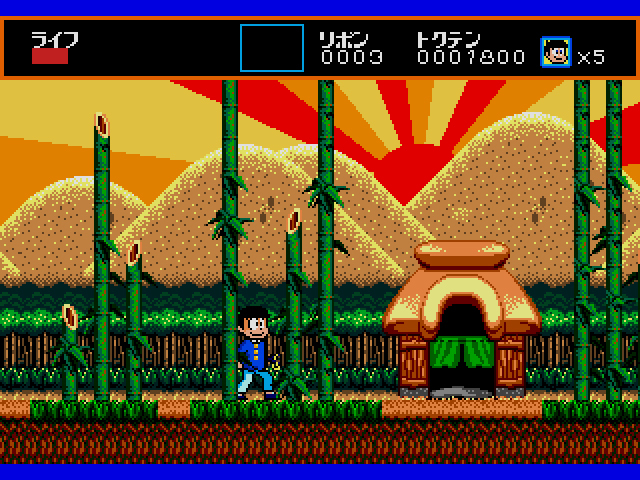 When Hachamecha Gekijou‘s first stage begins, the famous image of the Japanese rising sun is in the background flashing wildly behind the mountains. It’s a distraction, but it’s also a brilliant display of light and color, the best the Mega Drive has presented thus far. When Osomatsu-kun hitches a ride with a winged turtle, he’s taken to the cloud area, a beautiful array of purples, pinks, and blues. The second stage takes place on the outskirts of a forest, filled with lush green trees and grass. Osomatsu-kun’s character sprite is so expressive too. The fuller his life bar, he smiles and walks confidently, but when he jumps or is low on life, he opens his mouth wide in pain/fear. Good lesson, kids: when a creepy stranger points at you, run like hell. Beyond the colorful, inviting aesthetics is a game that offers little to the player. The stages are obviously non-linear so you don’t beat them in thirty seconds, and the extra items provided are pointless. The platforming isn’t terrible, just sparse: enemies come and go, there are no secrets, and the experience is over all too fast. 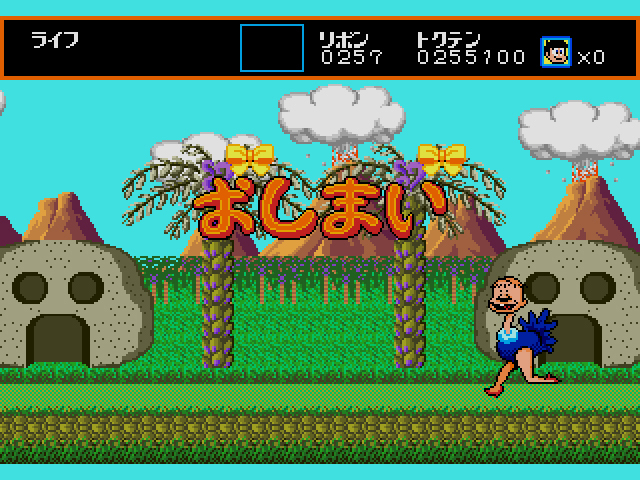 After you’ve beaten the third stage – the last stage in the game – in less than an hour, you’ll be wanting more of Hachamecha Gekijou. Not the game itself, but the nonsensical theater that Sega helped bring to life. Hmm…I was looking for an idea for a Halloween costume this year 😀 . Its surprising they didn’t rebrand this in to a different game for the West because there seems to have been a lot of that the most notable one being Super Mario Bros 2 (see I am embracing the Nintendo culture now I have a SNES). 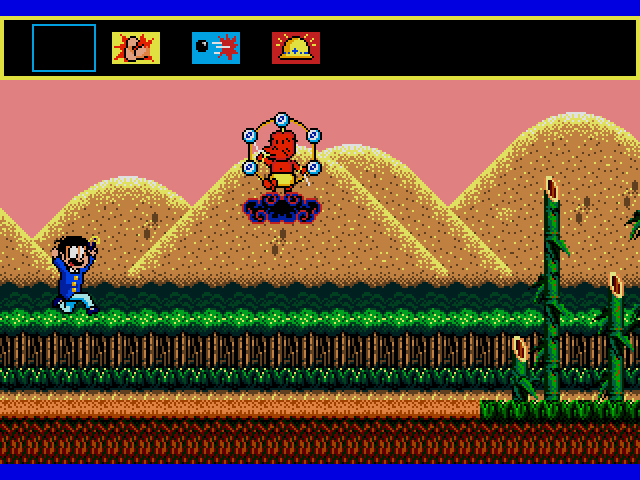 Alex Kidd’s first outing on the Mega Drive perhaps? I am not saying that would be a good idea just a possibility. Then again I think the cuteness of this might have clashed with the “mean, cool with attitude look” Sega North America were going for with the Genesis in those very early days. Yeah, I too am surprised that Sega didn’t rebrand this into something different. Particularly as it wouldn’t have taken much time. Iyami kun. Iyami kun. Hey guys, Iyami kun is the man in drag. At least he’s like the boys’ fun best friend. Like the fun adult best friend, that when he’s not scamming them, he’s doing weird things or spoiling them. Or just tricking them in the mischievous duo he and Chibita create. But he can be a nice father figure to them. In one episode after sneaking Ichimatsu away to a night out, on the way home, he speaks to Ichimatsu. To which Ichimatsu sits up and quickly replies, “I’m not sleeping! ! !” Iyami in a deep understanding mentor ly voice, says “hmm”. “We will always be friends, Ichimatsu” smiling to him. This is a beautiful moment; that depicts Iyami as an understanding male figure to the boys. As well as someone who has watched them grow up, and is a friend to them. Not just someone out to play tricks. Nice moment. Iyami s fun.